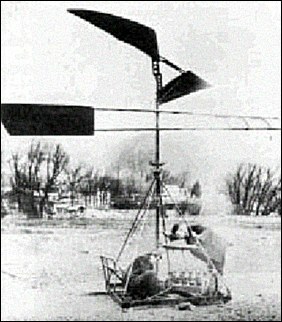 The first manned US vertical flight machine appears to have been developed by Emile Berliner and John Newton Williams. Berliner was an inventor who developed the disk-type phonograph record and designed what may be the first production rotary aircraft engine, the 36hp Adams-Farwell engine. In 1908, Williams constructed a coaxial machine for Berliner using two of these rotary engines. It reportedly lifted both Williams and the machine, a total of 277kg, but was probably steadied from the ground. In May, 1908, Williams built another stand in Hammondsport, New York, as a member of the famed Aerial Experiment Association (which included Alexander Bell and Glenn Curtiss), using a 40hp Curtiss engine. It made hovers around 1m, again steadied from the ground.